Please refer to our stock # BA301 when inquiring. 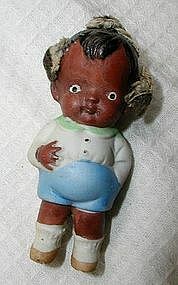 Measuring 3 inches high, this delightfully sweet, circa 1940’s, black bisque baby boy is in mint condition! Excellent paint, with not a chip or flake to be found! Dressed in painted blue shorts and white shirt, this little darling even retains his three, original yarn pigtails! Incised on back: JAPAN. A very, very charming piece of vintage Black Memorabilia!